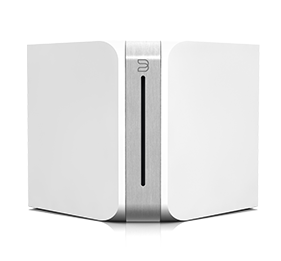 Bluesound are a hifi company making elegant and slick-looking audio systems. Their product range comprises streaming endpoints (Node and Powernode), speakers (Pulse and Duo) and a ripping/streaming server (Vault). In addition, some slick control apps are available for free from iTunes' and Google Play's app stores. Overall, Bluesound seem to focus on how their audio products fit in with your lifestyle, home etc. They offer audiophile quality sound reproduction, but with the convenience of wireless devices. If I were to pigeon-hole them, which is probably unfair - but I'll do it anyway - I'd say they were like Sonos but with dialled-up audio capabilities and device design. However, even the prettiest of hi-fi setups can be compromised by a messy, untidy music library. A disorganised library comes in many forms, and amongst the most significant of these is incomplete cover art. Why is incomplete cover art such a problem? Isn't it "all about the music"? Well, yes, but album art is important for two reasons. The first is perhaps more obvious; artwork is representative of an album, and part of an album's oeuvre. When you play Sgt. Pepper's, that famous cover is part of the experience, and it's something you'd like to experience in the Bluesound app. The second reason is more subtle and only comes from experience with large digital music collections. We, as humans, are pattern matching creatures, responding best to complex visual stimulii. When browsing a music collection it is far easier to identify a release by glancing at an image of its front cover than reading the title. Therefore album covers make our music library easier to use. So if you have a beautiful new Bluesound hifi, the beautiful Bluesound app on your beautiful iPad, but a lot of not-so-beautiful blanks where the album artwork should be, what are you to do? The image must be stored in either a folder.jpg or cover.jpg file, or embedded within the music file. The image itself must be no larger than 600kb. It is possible to do this manually. Likely, you will already have noticed where there are blanks in your library, so it is pretty easy to identify which albums need artwork, or have artwork which is too large. 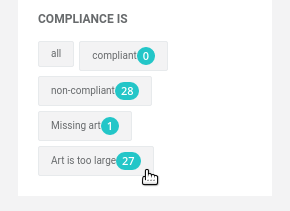 You can search for artwork on numerous sites and then save/overwrite this artwork as a folder.jpg inside each album folder. You'll need to ensure the image is under 600kb. In many cases this is shown on the website you are downloading from. But if not, download the image and use your operating system to tell you: on Windows, right-click then Properties, on OS X, right-click then Get Info. A word on consistency. If you have existing artwork above 600kb, I consider it bad practice to merely save artwork under this size as folder.jpg and retain the original artwork embedded in the file. This inconsistency and semi-duplication can come back to bite you later as you maintain your music library. If you have a mere handful of albums missing artwork on your Bluesound, that's probably the best way to do it. However, if you have a lot of albums missing the artwork, that process will begin to get tiresome quickly. Plus, when you add albums to your collection, you have to remember what you did last time. The alternative is to use bliss, which is fully automatic and will remember your settings so when you add music your rules can kick in without you having to remember them. First, download and install bliss. 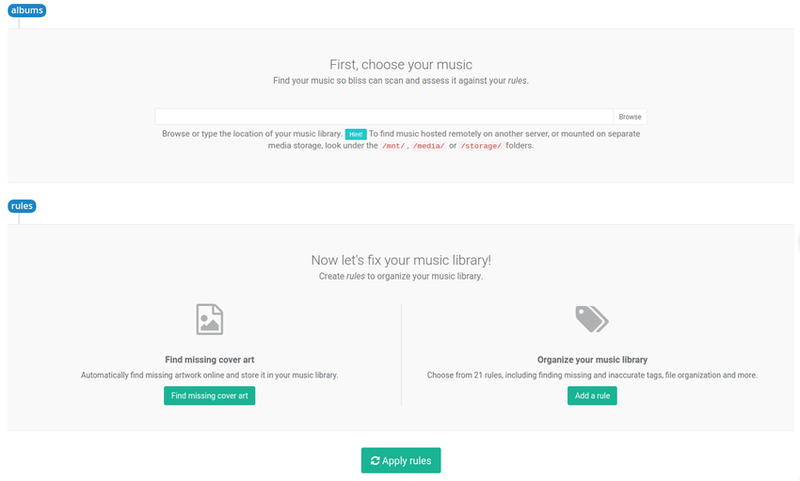 First, enter the location of your music library. This will be the same folder that you supplied as the PC/Mac/NAS Network Share within the Bluesound app. If you happen to know the UNC path for this share, in the form \\ComputerName\Share, that's easiest to use. Type that into the Music Folder field. If you don't know this, providing the music location depends on your operating system. On Windows, first "map" the network share to a drive letter. On OS X, you can "mount" the share using Connect to server within the Finder menu; this will then mount the share to a sub folder of /Volumes/. With the folder now mapped or mounted, you can select the path using the Browse button. Change the Saved artwork name to "folder". I would also suggest leaving Embed cover art in music files as Embed art where possible. 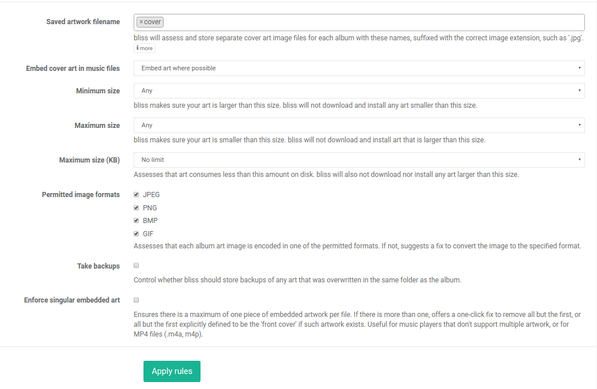 This ensures the same copy of artwork is present embedded inside your music files. Embedded art is, in my experience, the most portable way of storing artwork. If bliss finds an album without a folder.jpg, it will find artwork below 512 KB online and install it, saving to folder.jpg (and embedding it if you left that option as default as I advised). If bliss finds an album with artwork which is over 512 KB it marks this album Non-compliant but performs no further work. 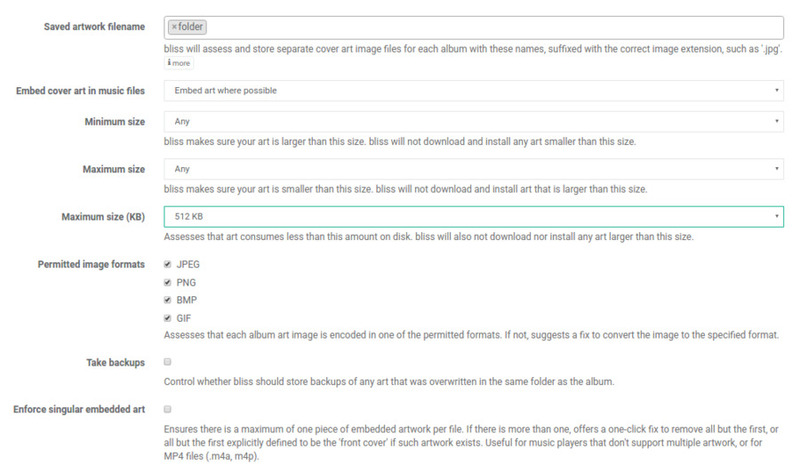 The albums list will filter to only albums that are non-compliant because their artwork is too large. 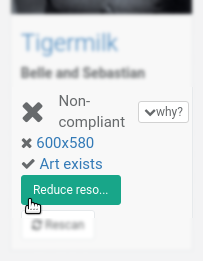 You'll also see some buttons to shrink the artwork - Reduce data size. Click them and all artwork for that album will be shrunk. The album will then be re-assessed, and should be compliant as a result (assuming no other rules are in place and causing the non-compliance). So you've run through the process, either manually or using bliss. But the artwork is still missing in Bluesound! What to do? The first thing to try is a full re-index of your library. From the same Navigation Drawer, select Configure Player then Delete Index. This time all entries in your library will disappear and, again, slowly begin to repopulate. If that doesn't work, try opening the Bluesound app, tap the Bluesound logo at the top-left in the Navigation Drawer and then select Reload Album Artwork. This clears Bluesound's cache of artwork and repopulates it, hopefully picking up the new, compliant art. A little 'gotcha' unrelated to Bluesound which is known to trip people up on Windows machines: Windows Media Player is known for altering Folder.jpg files such that they are hidden by the OS and marked as system files. This causes problems when other devices or software attempts to read or write to them. Workarounds are detailed in our special article covering this issue. Another metadata/library management related problem that occasionally pops up on Bluesound devices are split albums. This is quite a common issue and affects a number of different software and hardware devices. If this affects you, you may want to review ways to use bliss to resolve split albums. I hope this helps complete your Bluesound cover art, and potentially other metadata/library management issues besides!